VOSTOCHNY COSMODROME. A Soyuz-2.1b launch vehicle (LV) carrying Russia's Earth remote sensing satellite Meteor-M No. 2-1 and a group of small-size satellites has blasted off from the Vostochny Cosmodrome, in Russia's Amur region. 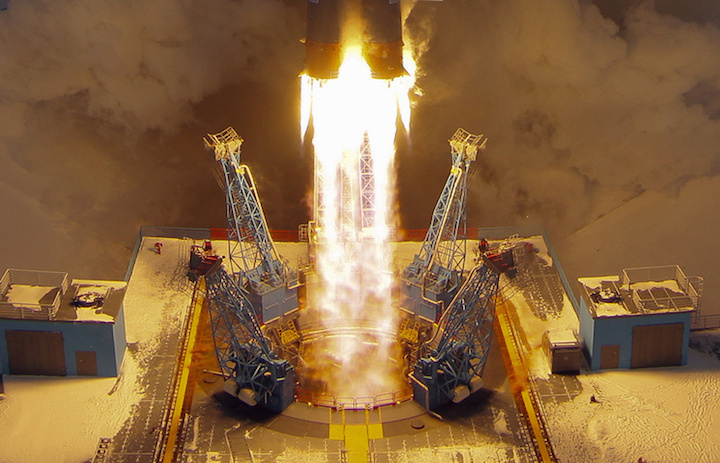 The LV lifted off according to the schedule at 8:41 a.m. Moscow time, marking the second launch since the Vostochny Cosmodrome was put into operation, an Interfax correspondent reported. The Soyuz-2.1b LV equipped with a Fregat upper stage will place Russia's Meteor-M No. 2-1 Earth remote sensing satellite, which will become the main payload, into orbit. In addition to that, the LV will also put another 18 small-size satellites, which are a hosted payload, into orbit. Russian Deputy Prime Minister Dmitry Rogozin has congratulated the launch crew of the Vostochny cosmodrome on the success of the Soyuz-2.1b mission. The crew lined up on the launch pad next to the service tower on Tuesday. "Dear colleagues, allow me to congratulate you on the successful launch of the Soyuz-2.1b rocket on behalf of the entire board of the Military Industrial Commission and me personally. For now, I'd like to thank you for the good and conscientious work you have done. Thank you very much for giving our country an occasion to celebrate. Thank you again and good luck. Hail Russia," Rogozin said. This is the second rocket launched from Vostochny, Rogozin said. The full-scale use of this cosmodrome "will ensure complete independence in delivery of all types of spacecraft into orbit," he said. "Having successfully accomplished the Soyuz-2 mission, we are discussing the second stage of the cosmodrome's construction. We will build another launch pad several kilometers from here for the Angara-5 heavy-lift rocket," Rogozin said. The second launch vehicle blasted off from Vostochny on Tuesday. A Soyuz-2.1b three-stage LV with a Fregat upper stage and a Meteor-M2-1 satellite as the principal payload was sent to orbit. The inaugural launch from Russia's new cosmodrome took place over 18 months ago, on April 28, 2016. It was a Soyuz-2.1a mission. EDITOR’S NOTE: The Soyuz rocket lifted off on time at 0541 GMT (12:41 a.m. EST) Tuesday, beginning a four-hour flight sequence to deploy 19 satellites into three different orbits. Check back here for a full report after the launch sequence is completed. A Soyuz-2.1b rocket lifts off Tuesday with the Meteor M2-1 weather satellite and 18 secondary payloads. 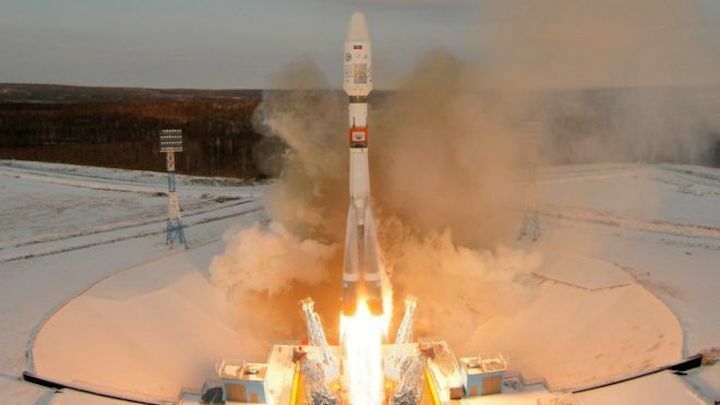 The satellite Meteor, launched from the Vostochny spaceport on Tuesday, is absent from the designated orbit and there is no contact with it, the Roscosmos corporation has said. The first scheduled communication session has failed to establish contact with the satellite due to its absence from the designated orbit," the corporation’s spokesman said. "Analysis of the current situation is underway." A Soyuz-2.1b rocket blasted off from the Vostochny cosmodrome at 08:41 Moscow time with 19 space satellites on board. The hydrometeorological satellite Meteor-M N. 2-1 was the main payload. The rocket also carried 18 smaller satellites. Roscosmos said "the Soyuz 2.1b rocket put the booster Fregat and space satellite Meteor-M in the designated intermediate orbit." Russia has lost contact with a weather satellite just hours after its launch from a new cosmodrome. "Contact has not been established because it is not on its planned orbit," the space agency Roscosmos said. The Meteor-M satellite was carried on a Soyuz rocket. The launch was at 14:41 (05:41 GMT), from Vostochny cosmodrome in Russia's far east. It is only the second launch from the base, which opened last year. Smaller satellites were also on board.